mmsonline.com December 2016 MMS 103 BETTER PRODUCTION Shops Using Technology turn of f the coolant. The settings for a 2-inch- diameter, six-pitch Di-Pos Hexa were 500 sfm, 4 0 i p m a n d 0.075 - i n c h D O C. T h e y l e d to a 28-minute cycle time and six-times-longer insert life. Surface finish came out well within the 30- to 60-microinch spec. Despite the higher removal rate, the spindle load meter rarely topped 50 pe rce nt a nd the ope ration ra n more quietly. Uniform C-shaped chips were produced, indicat- ing a very free-cutting action. "Running dr y on such a punishing material may seem counterintuitive, but cutting fluids can of ten create thermal shock that can crack the coatings on today's high-performance inserts," Mr. Johnson says. 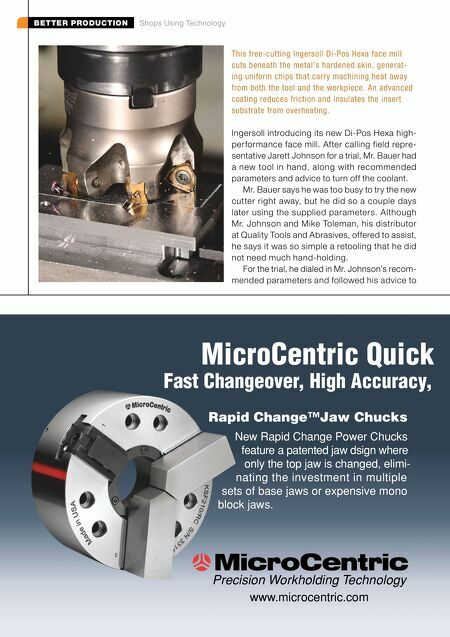 "Moreover, the Di-Pos Hexa tool is so much cooler running that cutting fluids Quick Change Collet Chucks MicroCentric introduced Quick Change Collet Chucks to North America in 1986. We offer Dead Length and Pull Back designs for Bar and Chucking applications up to 160mm (6.3") capacity. 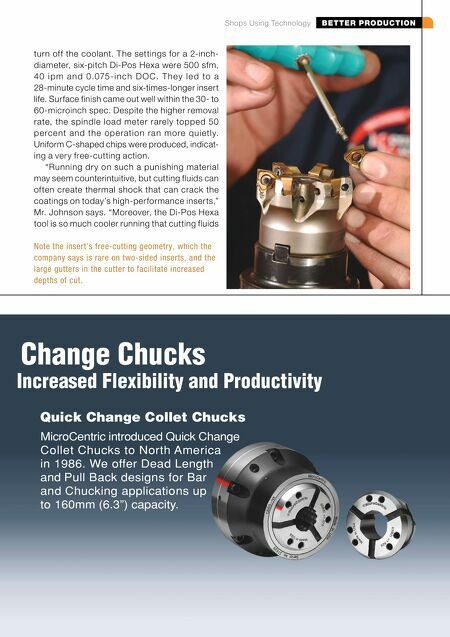 Increased Flexibility and Productivity Change Chucks Note the insert's free-cutting geometry, which the company says is rare on two-sided inserts, and the large gutters in the cutter to facilitate increased depths of cut.